Director of the Institute for Religion and Science, is Professor of Physics and Director of the Interdisciplinary Honors Program at Chestnut Hill College, editor of Teilhard Studies, the biannual publication of the American Teilhard Association, and serves on the advisory boards of the American Teilhard Association and Cosmos and Creation. Kathleen has also taught physics at Drexel University, Bryn Mawr College, Ateneo de Manila University and University of the Philippines. She has published articles in atomic and molecular physics and nonlinear dynamics in the Journal of Chemical Physics, the Journal of Physical Chemistry, Journal de Physique, Physical Review Letters, as well as Philippine journals and bulletins. Kathleen’s involvement in the emerging science and religion dialogue includes organizing programs, lectures, and conferences at Chestnut Hill College to support ongoing interest in the dialogue. 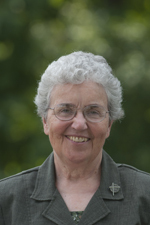 She received a John Templeton Foundation Science and Religion course award, the Quality and Excellence in Teaching award from the Center for Theology and the Natural Sciences, and an honorary degree, Doctor of Humane Letters, from Iona College, New Rochelle, NY. Her present research focuses on the work and synthetic methods of the Jesuit paleontologist, Pierre Teilhard de Chardin, particularly as it relates to modern science. She has published several book chapters and articles on these topics, edited a volume of essays about the life and work of Teilhard entitled Rediscovering Teilhard’s Fire, and is currently writing a book about Teilhard’s mysticism.